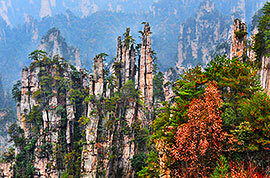 Zhangjiajie, a World Heritage Site as well as a World Geopark, is an uncanny workmanship of Mother Nature. 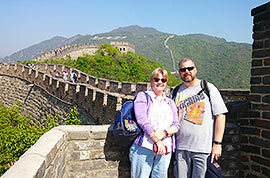 It is a favored destination for travelers from all over the world. Following our private Zhangjiajie tours, you will see the floating mountains of Avatar in reality, and have an exciting walk on the world's longest and highest glass bridge in addition to admiring the natural landscape at its best. Zhangjiajie National Forest Park: You can get a wonderful view at the Yellow Stone Stronghold, hike along the Golden Whip Stream, ride the Bailong Sightseeing Elevator and overlook the Hallelujah Mountain. Tianzi Mountain Nature Reserve: It is known as 'the Monarch of the Peak Forest' for providing visitors with stunning views of peaks, which rise one after another. Suoxi Valley Nature Reserve: What a visual treat to take the sightseeing train to admire the graceful peaks in various shapes on both sides along the Ten-mile Gallery! Zhangjiajie Grand Canyon: In addition to enjoying the breathtaking scenery, an exciting walk on the world's longest and highest Zhangjiajie Glass Bridge, which hangs over a valley, would be a thrilling experience to highlight your Zhangjiajie private tour. Tianmen Mountain Cableway: It is the longest cableway in the world, which takes visitors directly from downtown area to the top of the mountain in 28 minutes. Glass Skywalk: Here you can experience a walk on the clouds. 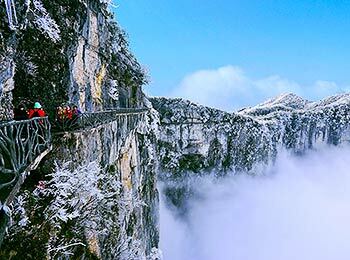 Tianmen Cave: Looking like a portal to the heaven, it is indeed a natural wonder. Generally speaking, you can take a 3-day Zhangjiajie tour package to visit the highlights in Zhangjiajie National Forest Park, the Grand Canyon and Tianmen Mountain. 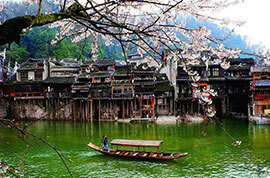 If you get 5 to 6 days, you can extend your Zhangjiajie tour itinerary to the Phoenix Ancient Town. 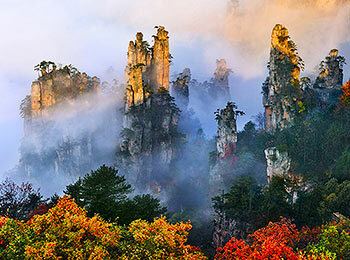 April, May, June, September and October are the best months to take a Zhangjiajie tour. From April to June, the climate is pleasant and the scenic area is full of lush green trees and flowers. During the autumn from September to October, the mountains and forests are all tinged with rich colors. Although it is a bit less comfortable in the hot and rainy summer as well as the cold winter, visitors can enjoy sightseeing without interference by crowds. What an amazing panoramic view of Zhangjiajie National Forest Park! Flight is the best option to approach Zhangjiajie, although some flights are scheduled in the early morning or late night. 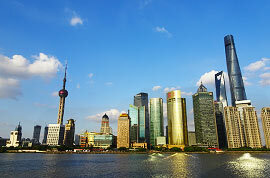 → Daily direct flights available from: Beijing, Xian, Shanghai, Guangzhou, Changsha, Shenzhen, Nanjing. 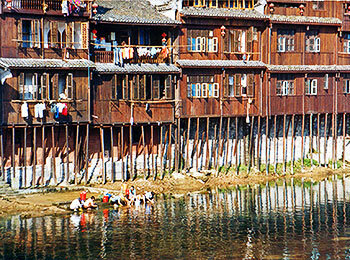 → Weekly direct flights available from: Chengdu, Hangzhou, Kunming, Chongqing. → International flights available from: Hong Kong, Macau, Taipei, Bangkok, Seoul, Busan, Nagoya, Fukuoka-ken. Direct trains run from Changsha to Zhangjiajie in 6 hours and from Yichang in 5 hours. Trains from other cities are not recommended as the journey is too long and tiring. Is it difficult to visit Zhangjiajie with seniors or children? No, to finish the itinerary is not difficult for seniors or kids who are fit and capable of doing moderate physical activities. The scenic area is well-equipped with sightseeing battery cars and cable cars. Although there is a daily hiking of 3 to 5 hours to enjoy the mountain sceneries, the roads and steps to the major sights are reasonably good to walk. Vera Yu is very response to our request. I look forward to have a great experience. Because Your agent was so helpful thru as many E-mails as necessary we put together a beautiful trip exactly custom tailored to all we wanted to see & do we couldn’t have asked for a better trip. How is the weather during February, and what can we do at that time? 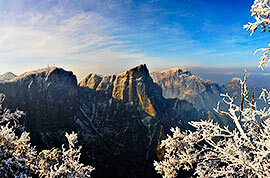 February is still winter in Zhangjiajie, the weather is cold with an average temperature of 7°C / 45°F. It usually snows in early February. Besides, it often rains and fogs in this period. 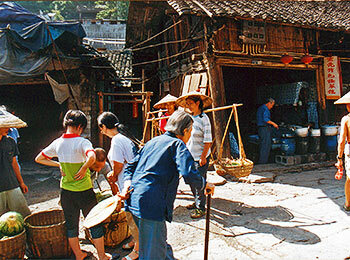 Although the best time to visit ZJJ is from April to October, it is also OK for a trip in February. If you are lucky, you will have chance to see the sea of clouds on the mountain and appreciate the beautiful snow-covered landscape in the scenic spot. As it is in mountainous area, just be sure to keep warm. can you please tell me the options how to get from Chengdu to Zhangjiajie? 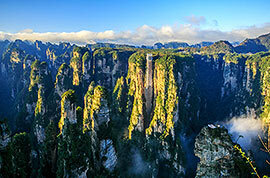 There are two options for you to get to Zhangjiajie from Chengdu. The most convenient way is to take a direct flight, which only spends 1.5 hours. Or you can take a high-speed train from Chengdu East Station to Yichang East first (6-7 hours) and then connect a train to Zhangjiajie (5 hours). You may also take train to Huaihua from Chengdu before heading to Zhangjiajie. What is the best way to go to Zhangjiajie from Kunming? We plan to go there on 1 april next year. For your reference, the fastest and most convenient way from Kunming to Zhangjiajie is by flight which takes around 3 hours. However, there is only one flight available which is operated by Juneyao Airlines. In addition, you can also choose to take a normal train from Kunming to Zhangjiajie. There are three trains available and the train journey is about 20 hours. we are a group of 6 persons & will arrive zhangjiajie on 2nd october 8.30 am . we check out on 4th october . please advise me how we can plan our sightseeing tours during those 2 days . As you have two days in Zhangjiajie, I recommend you to visit Zhangjiajie National Forest Park and Zhangjiajie Grand Canyon. In Zhangjiajie National Forest Park, you can see Yellow Stone Stronghold, Golden Whip Stream and Yuanjiajie. 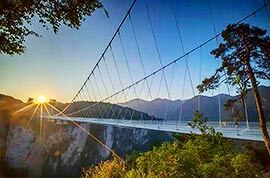 Besides, there is a must-see attraction in Zhangjiajie Grand Canyon called Glass Bridge which is said to be the highest and longest glass bridge in the world.